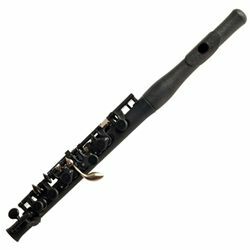 Made from the specially composite material Grenaditte and an entirely computerized engineering process, the Guo Grenaditte piccolo is truly an instrument of modern times. Grenaditte gets its name from the the color and sonic characteristics it shares with Grenadilla wood, a material used in the construction of professional wooden instruments. This along with a concave crown, various densities of material throughout the piccolo, and bell at the foot allow for an unusually broad, colorful tone with exceptional intonation and nuanced, ultra-responsive dynamics. Because of this material, Guo piccolos are impervious to changes in weather conditions and are incredibly light weight.